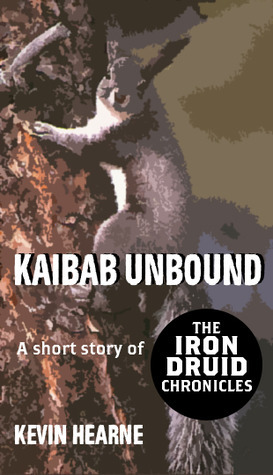 Kaibab Unbound is a short story following the misadventures of Atticus O’Sullivan and his wolfhound Oberon. Naturally, the tale is targeted toward those who are already loyal followers of The Iron Druid Chronicles, so readers interested in trying out the series should probably start with Hounded, not this piece. For those unfamiliar with Atticus, he is the last of the ancient druids and has lived for twenty-one-centuries. Thankfully, for him, he has discovered a way to retain his youthful appearance, so he seems nothing more than a fairly handsome, twenty-something year old, Irish guy. Atticus’ attitude matches his demeanor, which allows him to perfectly fit into his Tempe, Arizona home. The only time his normal life gets crazy is when ancient Celtic gods, goddesses, and mystical creatures show up causing complications. In this story, Atticus and Oberon are on the road to do some hiking near the Grand Canyon. On the way, however, they stumble upon a coven of witches that the ancient druid immediately assumes is up too no good. (As if witches ever did anything else.) Naturally, Atticus’ gut instinct is proven correct, and Kaibab Unbound tells a nice little story of his confrontation with these witches and their prey. All in all, Kaibab Unbound is a nice diversion for a half hour or so, but it lacked the usual funny banter between Atticus and Oberon, was barren of any Celtic gods, and focused instead on the confrontation with the witch’s coven. This entry was posted in 2 Stars, Short Stories, Urban Fantasy and tagged Atticus O'Sullivan, best urban fantasy series, Irish Wolfhound Oberon, Kaibab Unbound, Kevin Hearne, The Iron Druid Chronicles, Urban Fantasy, urban fantasy short stories. Bookmark the permalink.